In this quintessential Shakespeare tragedy, a young prince's halting pursuit of revenge for the murder of his father unfolds in a series of highly charged confrontations that have held audiences spellbound for nearly four centuries. Those fateful exchanges, and the anguished soliloquies that precede and follow them, probe depths of human feeling rarely sounded in any art. 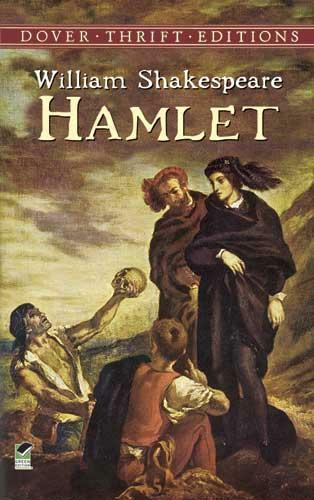 The title role of Hamlet, perhaps the most demanding in all of Western drama, has provided generations of leading actors their greatest challenge. Yet all the roles in this towering drama are superbly delineated, and each of the key scenes offers actors a rare opportunity to create theatrical magic.As if further evidence of Shakespeare's genius were needed, Hamlet is a unique pleasure to read as well as to see and hear performed. The full text of this extraordinary drama is reprinted here from an authoritative British edition complete with illuminating footnotes.A selection of the Common Core State Standards Initiative.